Convenience stores have become a common sight on the streets of Vietnam in just a few short years. The revolution came swiftly and silently. At the time, there was little to no indication of how far reaching its effects on this society would be. They appeared to be no threat at first, but in no time at all convenience stores have gained the upper hand. It seems almost absurd now, but just five or so years ago, if expats wanted to pick something up after the various corner stores and supermarkets had dropped their shutters, their options were severely limited, though local people always knew what was open locally. One of the safest bets for expats was to head to the Old Quarter and search out a dimly lit living room that had been converted into a late-night general store. A bleary-eyed gentleman sitting watching TV in his underwear would invariably be the ruler of this fortress of crisps and Choco Pies, and after a brief exchange, consisting of mainly garbled grunts on the part of the proprietor, everything required for a midnight feast could be procured. A riskier endeavor was to chance one’s arm by making a beeline for one of the very few Shop & Go stores that were dotted about town. Doing so meant rolling the dice, however, as there never seemed to be any rhyme or reason to their opening hours and it only took a handful of wasted journeys to put someone off for good. For those lucky enough to live in Ba Dinh, the local store on Giang Van Minh long had a reputation for peddling its wares into the wee hours. In comparison, the landscape of today seems almost unrecognizable. With Circle K already having opened 113 stores in Hanoi and 308 in Ho Chi Minh City, and Vinmart assimilating Fivimart to dominate the Vietnamese side of the supermarket industry, it is now nigh on impossible to travel anywhere in the center of town without having your eyes assaulted by the bright red signage and intensely fluorescent lighting that characterize these establishments. The pace of their expansion has been nothing short of staggering and it shows no sign of slacking, as more and more of the city falls prey to these neon demons. 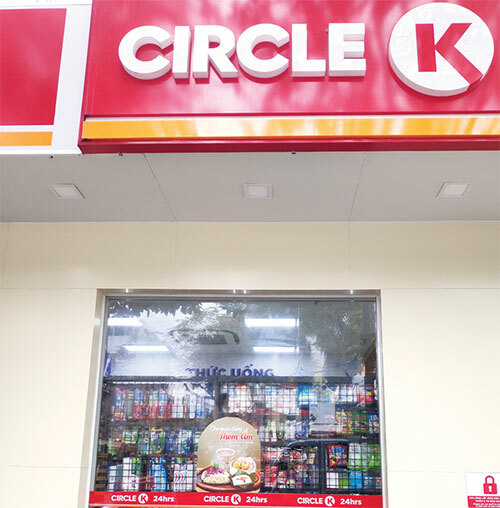 It should come as no surprise that Circle K has seen such success in Vietnam. After all, convenience stores are an integral part of the Korean and Japanese cultures that the young of this country are so clearly enamored of. They are already dressing like their East Asian counterparts, listening to their music, and watching their TV shows, so it seems logical that they would enjoy mimicking their shopping habits too. The reason for the popularity of these shops, however, runs deeper than the desire to simply be like other countries. These places have finally given teens and young adults a place where they can hang out, away from the prying eyes of adults, yet affordable enough for high school and university students to visit regularly. There can be no doubt that the opening of these stores on every street, lane and alley has had a detrimental impact on traditional stores. On any given night, the scene in any of the larger convenience stores is the same. Here you can see a group of friends chatting away over a bowl of instant noodles - snacks and drinks strewn across the table. There you can find undergraduates, headphones in, laptops open, frantically trying to complete an assignment before the deadline, with only canned coffee and energy drinks to keep them going. Outside, on the stoop, perch a group, laughing away and teasing each other, beer or cider in one hand and cigarette or vape in the other. Convenience stores have given these teens and twenty-somethings a taste of true independence and privacy and the urban young of Hanoi and Ho Chi Minh City have fallen in love with it. While the extent to which these shops have caught on with local people may have been a little unanticipated, it was pretty much a certainty that expats and tourists used to 24/7 shopping would take to them immediately. Prospective visitors to Vietnam no longer have to post in forums asking about where they can pick up toiletries or other necessities after arriving in the city late at night. The ubiquitous nature of these stores makes life far easier for those seeing this place for the first time. They have also been a godsend for foreigners who live here and work unsociable hours, as they can now pick up their bits and bobs at their leisure rather than constantly having to plan ahead. The rapid expansion of Circle K and to a lesser extent, Vinmart, has not been without its drawbacks. There can be no doubt that the opening of these stores on every street, lane and alley has had a detrimental impact on traditional stores. There’s something wonderful about having a close relationship with the neighborhood lady who sells you drinks and snacks that simply can’t be replicated by the experience of interacting with a spotty 18-year-old manning the till at a corporate mega-chain. It would be a shame if the sacrifice we have to make for convenience and comfort is the loss of the local shop. Another issue that has cropped up is the increase in underage drinking. Vietnam has never been the strictest of countries when it comes to selling alcohol to minors, but this has never really been an issue in the past. Now that convenience store shelves are being stocked with ciders and alcopops, school children are, sometimes on purpose and sometimes unwittingly, drinking more and more. This will need to be addressed before it balloons into a bigger problem. It is a little saddening to think that the impression that first-time tourists seeing this city will take away is that it is one that is overrun by convenience stores. The country is developing at an alarming rate but it would prudent to ensure that none of the charm that characterizes Hanoi as being one of the most special cities on earth is lost in pursuit of progress. A group of expats in Hanoi will organize an event tonight on International Women's Day (March 8) to celebrate women’s achievements and call for gender equality as well as raise fund for Vietnamese children.